After taking a break for the first time in years, the Assassin's Creed franchise stormed back with last year's Origins. Featuring a mix of old and new, the game delivered a new combat system, satisfying stealth, expanded exploration mechanics and a focus to bring more RPG mechanics to the series. The story wasn't very involving and some issues prevented the game from being a reinvigoration of the franchise. Clearly, that break was meant to re-invigorate the series with a new foundation, as now we have Assassin's Creed Odyssey, which continues from last year's effort while adding new mechanics on top, and of course taking players to a new historical location. The franchise has been through its fair share of historical time periods, and at its current trajectory we're still moving ever further back in time. Odyssey takes players to ancient Greece in the year 431 BCE, which is four hundred years before Assassin's Creed Origins. Players assume the role of a fortune-seeking mercenary who, after being separated from their parents at a young age, finally gets a chance to leave the island where he grew up on the streets, and explore the lands and seas of the region. Before heading out on this ancient adventure, players are faced with a choice of two lead characters. The setup is that the modern-day duo of ex-Abstergo employees Layla Hassan and Dr. Victoria Bibeau have discovered an artifact with the DNA of two people, so players get to select if they want to explore the memories of siblings Alexios or Kassandra, via the Animus. The decision to have two playable characters isn't new - Assassin's Creed Syndicate pulled it off well, and also happens to be from Ubi Quebec - but with Odyssey, you must stick with that character for the entire game. The story and gameplay remains the same regardless of your selection, apart from some minor dialogue changes. 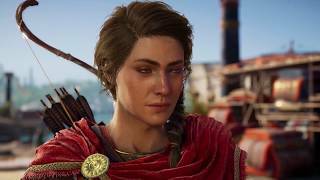 Both heroes are likeable enough though - Alexios mixes the tough guy / dry humor archetype, while Kassandra also has her funny moments but further carries some emotion in her acting. In the modern day, as mentioned, Layla and her crew of would-be resistance members to Abstergo are still trying to learn more about historical artifacts and where they may be located in the real world. Just as in Origins, this storyline is practically non-existent, to the point of wondering why Ubisoft is even bothering with it. The characters are bland and forgettable, and they get so little screen time that you wonder if those sections even need to be playable. The ending of the modern day storyline is quite absurd and over the top, while the conclusion in the historical era is subdued and the final hours don't feel any more thrilling than the previous 40. Back in the Animus, the main conflict in this land during the time was the Peloponnesian War, fought between Athens and Sparta. But just as the rebellious characters from some of the previous games in the franchise, our hero does not meddle in politics. At first, the quest is to finally escape their home island and explore the world, but after being betrayed, the protagonist finds that there is more to life than just making money from whichever side is paying more. The hero carries with them the Spear of Leonidas, an ancient artifact with strange power, which belonged to their ancestor. With such a strong bloodline, it's not long before the hero crosses paths with a mysterious organization known as Cult of Kosmos, who are seemingly trying to take control of the entire Greek world, and also go after all members of our hero's family. 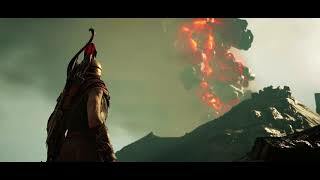 The story in Odyssey is well written and feels much more engaging than Bayek's journey. The threats to the hero and his/hers desire to reunite the family are immediate, and the game keeps a good pace through its first half to keep players invested. The characters and their motivations are interesting, and of course you'll get to meet famous figures of the time, like Sokrates, Hippokrates, and others. While all this is great, the game does run into trouble stringing all of this together. Almost all of the quests feel individually written, which leads to some dialog continuity problems if, for example, you go back and do quests that were given a while back behind your current story progress. And you may well choose to do so, as the scaling up of content makes it worthwhile. The narrative pacing also grinds to a halt in the third act, as the next story missions suddenly become 5+ levels higher than their predecessors. The same happened in Origins but it feels worse here because the story is actually worth following. So, you'll often need to engage in optional quests to level up. The story-focused side quests are just overall more interesting and involving than Origins, letting players face some immediate problems and make decisions. Unlike Origins, characters don't spend tons of time telling some sob story or just generally dumping too much exposition for what would amount to a fetch quest anyway. Quests move at a brisk pace, and are just more enjoyable to complete thanks to stronger and more focused writing. There's also basic contracts that offer straightforward objectives like collecting things or defeating certain number of foes. Whichever you pick though, you're likely going to be running the same errands as usual – fetching items, eliminating targets, infiltrating forts to steal something, and so on. As with the player character selection, the idea of choice extends deep into the Odyssey design. With last year's Origins, the franchise took a hard turn towards adding RPG elements, and this trend continues here. In conversation, you'll sometimes need to make decisions, and these do affect the story, as in any modern RPG. The game does a good job of making the choices matter – such as making characters you spared re-appear at key moments later on, or affecting the immediate aftermath of events. There are multiple endings to the main story, too, depending on how things play out. Further, most conversations feature dialogue choices, but they are rather formulaic – an indicated option will progress the conversation, while the others are optional and always revolve around either getting location information or background details. This rather basic implementation of a dialogue system leads to a few awkward changes in tone. Depending on what you choose to say, the conversation could take wild turns and inconsistencies can arise, as the game seems to work on a rather elementary question/response system rather than taking into account the entire dialogue and quest line. For example, you could be talking about leaving an important character to die, and the conversational partner would disagree with you. If in the next part of the quest you change your mind and say you should save them, the other person now responds with the idea of letting them die. Heck, even at the beginning, you must choose which hero you want to play as without ever meeting them, making it purely a guess, which seems like poor design. Despite its ambitions to turn into a full-on RPG, Odyssey still has some ways to go. The reason you might be asking others for directions is thanks to a new gameplay mode called Exploration. In this new mode, the game attempts to guide the players a little less, by removing some of the GUI elements that point directly to the objectives. Instead, you get a few clues and have to find your way. Usually, the clues are useful enough, pointing out the name of the region and perhaps a nearby landmark. This makes most locations easy to find – further, they are still often displayed on the map as question mark icons, so you know something is there and likely where you need to go. The Exploration mode doesn't exactly make you think very hard, but it's a decent alternative for players who may be sick of constant hand-holding. If you prefer not to bother with directions, you can switch to the usual Guided mode at any time. Just as in Origins (and pretty much all previous games) where you had to hunt down a group of leaders and eliminate them, you must do so again here with the members of the abovementioned Cult of Kosmos. The twist, however, is that you must first reveal the identities of these men and women. To do so, you must progress the story as well as complete numerous side quests in their region. Their ranks are laid out in a few branches, so you can tackle a few different angles at once. For some of them, things may get a little annoying as the only clue to their whereabouts could be "a cove on the coast", or them owning a marble quarry somewhere in the region. This means you'll need to meticulously search the area (which is usually rather large), but it definitely adds a sense of exploration and not having the game simply point out their location. You must do this regardless of Exploration or Guided mode. The cult members themselves are usually guarded and have plenty of health, so silent assignations are rarely possible, which is perhaps disappointing – the game as a whole entirely lacks the series' trademark silent assassinations of main targets. You must fight almost all bosses you meet. Eliminating the cult members isn’t just for the story though, as they also carry mysterious fragments that allow the hero to increase the power of the Spear. This acts as a basic progression-check, as the Spear itself doesn't really have stats and is used more like the hidden blade would be in other games. Instead, upgrading the Spear lets you unlock the top-tier upgrades for your combat skills. Much like last game, everything you do in Odyssey earns you experience points to distribute in a skill tree. The skill trees are fairly straightforward, and split into three categories – Warrior (melee), Hunter (ranged), and Assassin (stealth). Unlike Origins, the game wastes no time getting to business – even the very first skills offer immediate and powerful effects and abilities, and they are often active skills rather than passive buffs. You feel like you're growing more powerful from the very outset. Stealth remains largely unchanged, apart from a few unique abilities you can unlock that help with the movement. You will still infiltrate plenty of enemy camps and forts, each with their series of objectives, after first sending your trusted eagle to scout and highlight enemies and loot. The AI remains somewhat awkward in stealth, with narrow lines of sight, odd searching patters and glitchy climbing. As mentioned, many of the Captains and tougher foes cannot be taken down instantly, so you'll often get involved in skirmishes. The combat continues to evolve from the good foundations of last year's entry. Odyssey feels like a faster paced action game, and one that has fully adapted an ability-based combat system, perhaps similar to this year's God of War. Many of the skills you unlock are active abilities, and get added to your controller face buttons. In the midst of combat, you hold the ability key modifier and then press one of the buttons to execute the attack you've assigned there. The game offers plenty of attacks, so you can actually fill out a second 4-button layout and swap between them. While endlessly dodging and parrying works, using abilities in combat definitely helps you gain an edge. You could use the new amusing but effective Spartan Kick to push foes back, heal yourself, take away opponents' shields, rain down a storm of arrows on a location, shoot an arrow that can pass through walls, or light your weapons on fire. All of the skills use an adrenaline bar, which builds as you land hits. The enemy AI is pretty decent in a fight, using lots of abilities of their own and generally keeping you involved. They have an outline when dishing out unblockable attacks, so you can dodge or use the new longer roll. There is a lot of knockback to Odyssey's combat, with powerful attacks often flinging the enemies (or they you) pretty far back. As in the last game, you'll collect weapons and gear over the course of the journey. Not much has changed in this regard. Gear has a character level requirement, and comes in a few different rarity levels. New to Odyssey is the ability to add engravings – small passive bonuses to your stats. You unlock engravings over the course of the game and side quests, and they can be applied an unlimited number of times once available. The weapons arsenal features spears, staffs, heavy blades, heavy blunts, daggers, swords and of course the bow. The materials system has been scaled down, and there are just a few types of resources - iron metal, wood, obsidian glass, leather, and gems. You'll notice these materials are natural, and they mostly come from caves and forests, so there is no need to hunt annoying rare animals anymore – all creatures just drop leather, which makes your life a lot easier. Odyssey is quite generous with resources, be that new gear, crafting materials or money, so you shouldn't have to worry about keeping yourself competitive. The combat is well designed and satisfying, but it can drag on – facing elite enemies the same level as you will mean quite lengthy encounters, as you hack away at their seemingly huge health bars. Fans will remember the Mercenary system from last year's game – this time it has been expanded. For committing crimes (stealing or fighting anyone, anywhere) your bounty will increase and mercenaries will come after you. You could complete Origins with rarely seeing a single merc, but this time around they are extremely common. At first, it's a fun mechanic – your wanted level raises fast, and mercs spawn frequently and nearby, giving you plenty of practice in combat. By defeating them, you can even move up in a ranking system to be the best mercenary across Greece, and get some passive bonuses along the way. However, you'll soon learn that these mercs show up extremely often, and everywhere. Whether you're trying to stealth your way through a fort or having a boss battle in a cave, the mercs will just casually spawn in or walk in and join the combat. It becomes annoying and extends the fights for longer than they need to be. After a while, it grows so repetitive that you'll be paying off the bounty to clear your wanted level as soon as possible (thankfully this can be done at any time via a menu). If you raise your wanted level to max, it just becomes an endless battle as five mercs will attack you, and by the time you may defeat a few, new ones will arrive. It's a decent mechanic that was definitely tweaked too far the other way from Origins. While on the subject of disappointing new mechanics, there's also the new Nation Power aspect. Each region on the game's massive map is controlled by either the Athenians or Spartans, and you can change that. First, the strength of each area's leader must be weakened by killing local soldiers, or looting/destroying their supplies (which are always in a fort). Doing so will eventually cause the leader of the region to be vulnerable (usually having no guards and spending their time outside of secure city walls), leaving them exposed. You don't really have to wait for that – you can fight your way through to the leader even when he is at full strength. With the leader gone and region weakened, a new Conquest Battle becomes available. This is essentially a fairly large battle with a ton of AI, where you must fight well in order to ensure your side prevails – by eliminating as many soldiers as possible, as well as commanders, before the enemy does the same. It's an interesting set of mechanics, perhaps reminiscent in some ways to Shadow Wars from the recent Middle-earth game, but it feels meaningless. Your rewards – a few pieces of gear, and whatever experience acquired – aren't really worth the time investment. It matters so little, in fact, that in the Conquest War you can just choose to defend the faction which you just weakened, to let them keep control of the region again. Whatever the outcome, the region will reset, a new leader is setup, and things are back to the same way as before. It's pretty baffling that the developers didn't include some sort of global war mechanic that gives you bonuses for turning the tide by letting one side take control of most regions. You can complete the whole game ignoring this mechanic entirely. Neither faction is hostile to you outside of their forts, so there is no gameplay difference if you're exploring a Sparta or Athens controlled region. This ancient world is certainly huge, and filled with historic sites. The sense of discovery is once again quite satisfying, more so due to the map's renewed focus on water traversal. The world consists of a large landmass and many medium/small islands, which means there's less boring horse riding across vast empty dunes. On foot, your destination or next point of interest is never too far away, so you can always stay engaged with your surroundings, something that Origins lacked. You can climb pretty much anything, as finding footholds and handholds is mostly a thing of the past. The high-up synchronization points still act as fast travel spots, and you'll want to unlock those because sailing between islands takes a little bit of time. Sailing is back in full force, though it still lacks a bit of the magic that made AC IV Black Flag so special. As with the game's indecision of having the hero choose a side in the war, ships of either faction will not be hostile unless you attack first or encounter pirates. 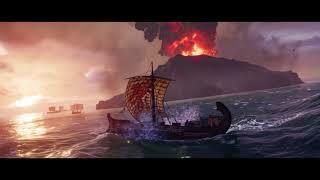 Sailing is straightforward, and ship combat is the same as it was in Origins, meaning it can be pretty visceral and exciting, as the ships are large but have decent maneuverability to outwit the enemy. Because the ship is yours to keep, you can upgrade the hull, weapons damage, and so on. You can also recruit up to four members for your crew, who provide small passive bonuses to the ship's stats. The recruitment process actually involves non-lethally knocking out enemies while exploring the world, and asking them to join. But this mechanic provides such a small benefit that you can entirely forget to use it. Just like on land, you can take on naval contracts to perform basic assignments. For a world as large as this, Odyssey looks pretty good on base PS4. Lighting effects once again shine (no pun intended), and a lot of the texture work is well done. Animations for climbing, combat, and stealth are good. In conversation, some of the facial motion capture looks rough, and characters expressions can be rather stiff when they are trying to be highly emotional, even our main hero, which is surprising. Audio design is fairly minimalistic, and music will actually not persist through some battles, leaving you in silence. The voice actors do a decent job, though Alexios sounds a bit odd at times. In the technical areas, the new game falls a bit short. There are famerate issues throughout, particularly when exploring the game's large cities like Athens. Loading into the world and fast travelling takes a bit of time, but there's also loading screens during each NPC conversation. Whenever you speak with someone, be that to get a new quest or turn one in, there is anywhere from 3 to 10 second loading screen. This makes the game feel like a slog, and really adds up to a ton of waiting over the course of its 40+ hours. Last year's Origins charted a new path for the long running action adventure franchise, and Assassin's Creed Odyssey is a direct continuation. The game offers further updates to the combat system, an improved main story with satisfying quests and the ability to hunt down the cult at your own pace. In a sense, it improves on everything that Origins introduced, but the new mechanics could have used a bit more fine tuning. The presentation quality is okay, but certainly has room to improve. The framerate issues and loading screens are a bit too numerous to ignore. If you've enjoyed last year's game, then Odyssey is certainly an improvement and likely to satisfy. But as mentioned last year, if you're looking for something entirely new from the franchise that doesn’t involve fetch quests, combat, and assassinations, then you may need to keep waiting. A wondrous and detailed recreation of an ancient land that's absolutely large in scope and features good level of detail. Some animations and cutscenes are not quite fleshed out. The elements introduced in the previous game are more fleshed out, while the new mechanics feel a bit overdesigned and could even be forgotten about. A long winded exploration-focused title that sometimes feels like a grind, and at other times the story elements and some quests are fairly entertaining. Frequent and occasionally long loading times, some framerate issues on base PS4. Assassin's Creed Odyssey improves on its predecessor, with the new RPG focus of the franchise really starting to take hold. A better story and enjoyable combat can't quite overcome the repetitiveness of this sprawling 40 hour experience, but at least we're sailing in the right direction. "The rebooted stealth action franchise forges ahead"
Assassin's Creed: Odyssey is ranked #678 out of 1434 total reviewed games. It is ranked #40 out of 146 games reviewed in 2018.